So, while searching through Google for good reference pictures of wolves, I happened across this pic. Upon staring at it for a while, and going, “What in the HECK?” I clicked on the original site. 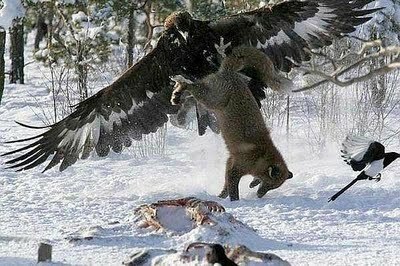 Turns out it’s a story about people in Central Asia who train golden eagles the way other people train small hawks and falcons, and they use them to cull the local wolf population or hunt them for fur. I think I read a book about them once (I’m not sure where it took place, but Central Asia seems about right), and it was utterly fascinating. Here’s the blog if you want to see more far out pictures. With more details, too! Wow that is awesome. I have always enjoyed that book, Ali and the Golden Eagle. Then to see it is just amazing.